It gave us great pride to review the entrants into this years HDL Awards. In all categories it was clear to see how far the brand has come in recent years. The scale, professionalism and pride taken in all HDL installations is amazing to see. This year we wanted to showcase the efforts of some key partners who have essentially carried the flag for HDL in the UK. As you read below we're sure you will agree their installations are of the highest standard. Kris and the team at Customised have been loyal partners of HDL for many years. Their work this year included a popular 100+ circuit Dali Lighting installation in Holland Park, London. The HDL installation in this instance gave the client the ability to build dozens of lighting scenes that could be quickly edited and customised by the user. Kris believes this is a key advantage of of installing HDL, “The difference with HDL is the empowerment of the homeowner. For too long control systems have been the domain of the installer and all changes had to be completed by the installer. The HDL app gives the homeowner greater control of their favourite lighting scenes”. At HDL we are humbled by the support and professionalism shown to us by Kris and his team. Its therefore gives us great pleasure to award Customised HDL installer of the year 2017. For this years residential award we wanted to seek out the complete smart home that incorporated a range of integrated systems and control platforms. After much deliberation we simply couldn’t split the entries from Securilec and I Cubed. Both were stand out installations of the highest quality, exceeding all criteria we set for the award. Below is a summary of this years award winning entries. A large new build exclusive development in Norfolk. The project was divided into three systems, each having their own subnet and linked together via the sites primary ethernet network. User control is achieved through a combination of DLP wall plates and the HDL App. Dimmer and other control modules are located in three central locations which are the ground floor, first floor and external barn. These are housed within Future Automation DIN rail enclosures. Heating modules were enclosed within a steel consumer unit style enclosure and were located at each manifold position, four in total. The system comprises 24 dimming modules, 1 relay module, 2 curtain controllers, 9 heating control modules, 34 DLP wall panels, 3 DMX lighting modules and other control and input modules. 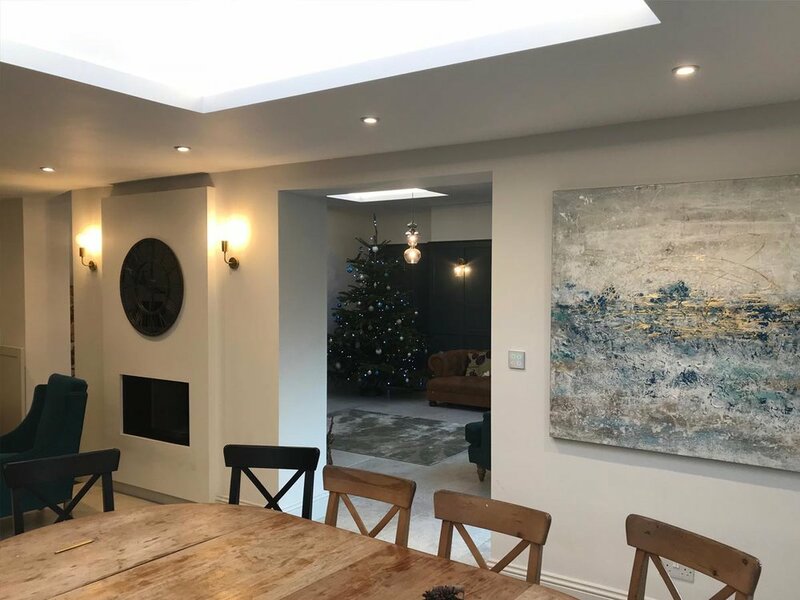 A mixture of LED replacement lamps, dimmable LED down lighters and RGBW LED colour change strip was chosen to provide ambient lighting within therein house. 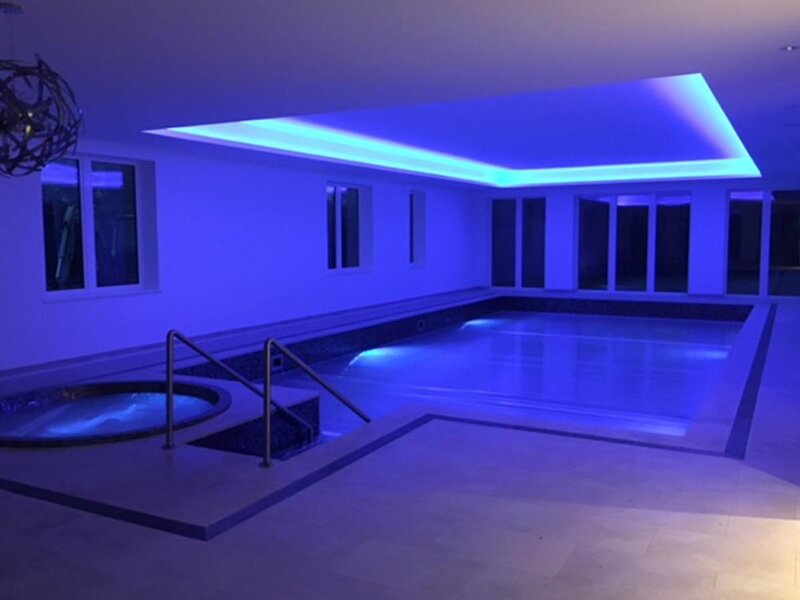 All lighting within the main house has been made dimmable through HDL's dimming modules, 0-10v controllers or DMX modules that control the colour changing LED strip. Internal motion sensors control lighting to all ensuite bathrooms and a rear stairwell. Lighting is programmed to illuminate all hallway circuits and one circuit in each room on activation of the fire alarm system which is interfaced through the HDL 4 channel input module. Also triggering the intruder alarm automatically activates the external and security lighting. The external lighting consists of a mixture of LED enclosed batten fittings, decorative LED down lights and decorative feature lighting. External car port lighting is controlled via interfacing with the main gate to provide a welcome home illumination upon arrival or via local HDL external motion sensors. Asked why HDL was specified on this installation, Mike from Securilec answered, "This system was chosen for this project because of the easy integration of heating control within the main lighting control switch. Our customer liked the "less is more" approach to keeping walls tidy along with the easy to use app and multi-use DLP keypads. All but 2 of the keypads installed on this project were custom finished to the clients requirements with a mixture of gold and stainless finishes. The fact that the heating temperatures could also be averaged across 3 DLP panels without having lots of extra thermostats was great. Blinds are also controlled via the kitchen DLP's and the app giving flexibility of control. Being able to divide the site into sections and connect into one platform on the ethernet network with complete stability was also a good installation factor for our team”. Its with great pleasure that we award Securilec Residential HDL Installation of the year 2017. A residential renovation and extension featuring complete lighting, heating and home automation system. 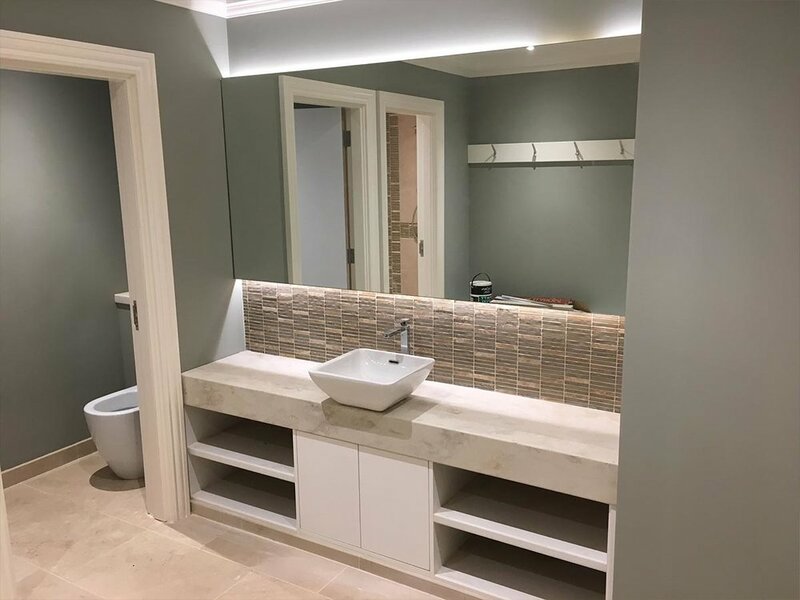 After initial meeting, we designed a HDL system that would provide the client with scene lighting combined with control for the underfloor heating throughout. Across the entire ground floor, every lighting circuit has been linked back to the central HDL hub. A combination of DLP and iTouch keypads provide scene lighting through a combination of recess spots, wall lamps and LED feature lighting around the 4 skylights. The kitchen is open plan to the dining area. 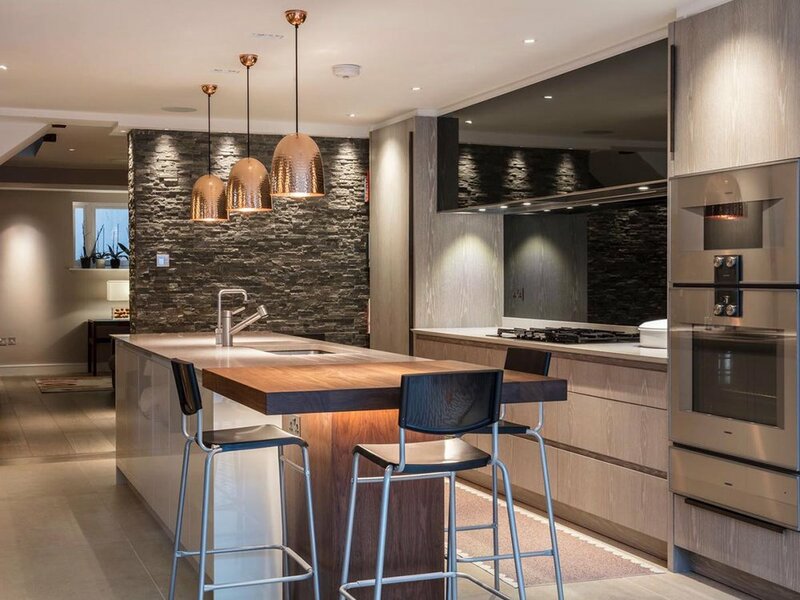 Pendants along the kitchen island provide focused task lighting with the ceiling spots, wall lights and 3 LED Skylights, illuminate the space and set the perfect scene for entertaining, cooking and dining. The Orangery is the perfect retreat away from the busier kitchen/dining room. Simple wall lamps, central pendant and LED skylight provide gentle illumination ideal for seating back with a glass of wine and reading a book. The Utility room provides the highest level of automation with 2 PIR sensors operating the ceiling spots and twin pendants based on two parameters, Motion and Lux level. Depending on incoming brightness and motion detection the PIRs operate the lighting to best reflect the conditions of this dark space. Some fun was also designed into the lighting scheme with the Play Room being named the "Monkey Room". Four monkey lights provide the only lighting in this room. Each Monkey striking a different pose with two shelf mounted and two hanging from the wall. This is a really fun room for the kids to enjoy TV. Within each main room, DLP keypads were chosen to provide monitoring and adjustment of the zoned underfloor heating. Simple scheduling enables the home to regulate itself and heat the home to perfection. As part of this project, we integrated the lighting into an Elan control system, offering seamless operation of the home entertainment linked to the lighting scenes. Additionally "Alexa" has become a key part of the control. Simple voice commands now prepare each room for the optimal lighting scene and TV entertainment. iCubed have been a parter of HDL in the UK for many years. Asked what makes the the HDL difference, Iain commented, "As a professional integrator, we look for reliable, high quality solutions to meet our clients requirements. We choose HDL as the extensive range of lighting modules, system gateways and flexible programming approach provides a robust, solid and high performing system for our clients. The huge range of keypads offer great choice for our clients who are focused on ensuring each element of their home build/renovation meets their exacting standards. The flexibility in style and colour hits the spot every time. For us, support when needed is of high priority and it is not only the product that aids our choice of lighting system. Throughout the 5 years we have been providing HDL systems, the technical support has been first class and re affirms that our decision to use HDL was the right one”. Its with great pleasure that we award iCubed Residential HDL Installation of the year 2017. What we loved about this installation was its scale and simplicity. This Cable Gold installation took place at the De Salis studio school in Hayes Middlesex. The HDL system included over 400 independently controlled banks of lights via over 70 multifunction motion sensors including presence and vacancy detection. The system also included child adult zone supervision with cause and effect programming. 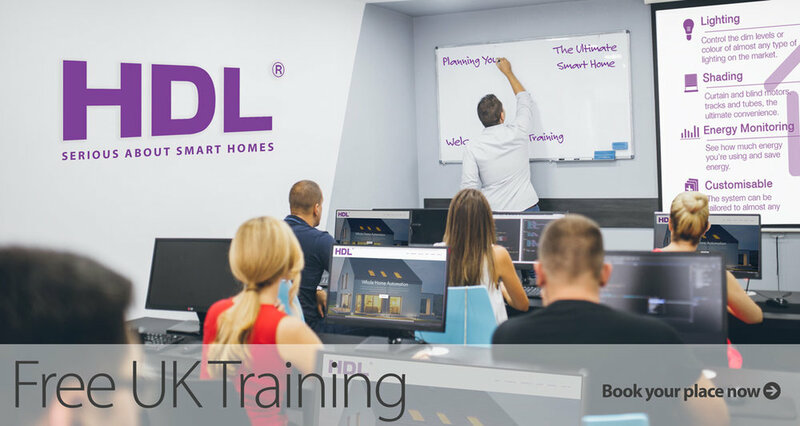 Nick from Cable Gold told us why he specifies HDL, "Simple cost effective installation methods and intuitive programming interface with some of the best support and technical advice we have had the pleasure of dealing with. We are recommending HDL for all of our commercial prospects”. Its with great pleasure that we award Cablegold Commercial HDL Installation of the year 2017. As the market for smart buildings continues to grow rapidly we are quickly building a great network of partners throughout the UK. For more information and to book one of ur our FREE one-day training courses contact +44 (0) 115 824 88 11.